It’s January and the gloomy, blustery British weather is doing its very best to induce hibernation. It is definitely a time of year for sitting by the fire with a new challenge to stimulate the mind. As part of my blogging journey I am really hoping to challenge myself to learn some new skills. A page in the back of my one of my crochet books gave some basic instructions for interlocking crochet and I just had to give it a try. I am a fan of wintery colours. 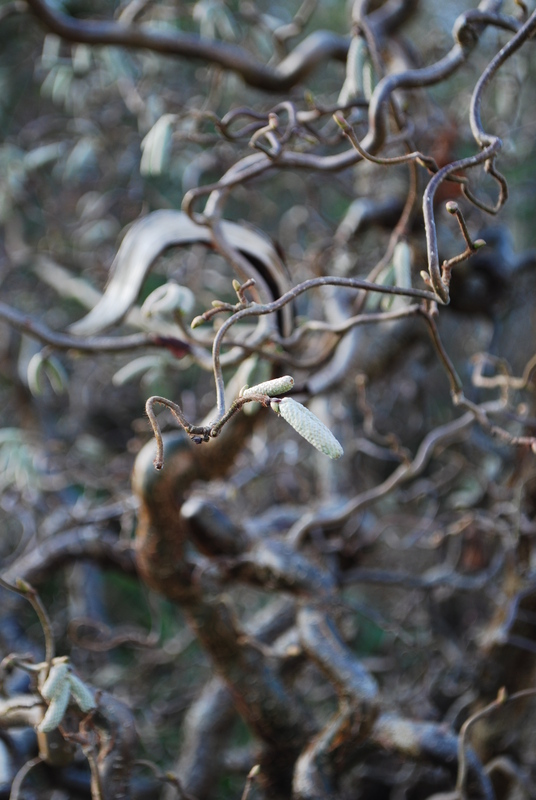 I love the subtlety of silvery greys and soft, murky greens. I may well surprise you with some warm, bright colours one day but for now I will stick with the winter palette. 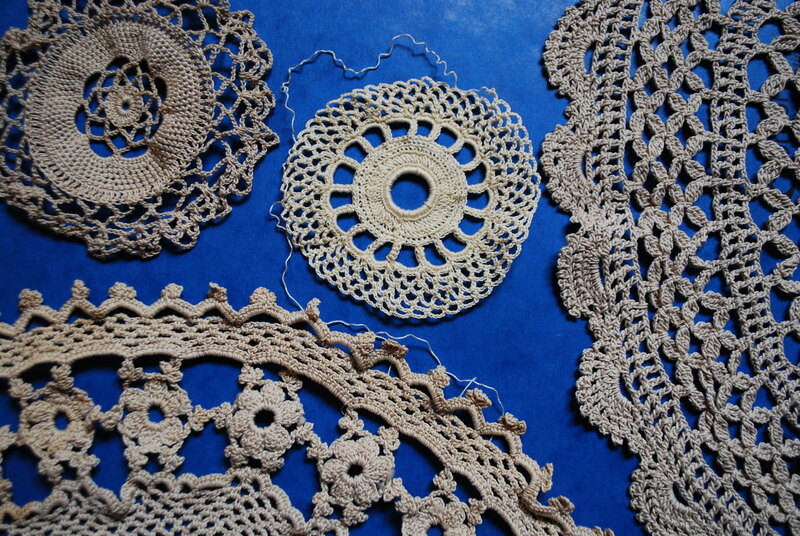 A quick google search informed me that Tanis Galik is the authority on the subject and has developed a formidable range of interlocking crochet stitches. A combination of the written instructions in The Complete Photo Guide to Crochet by Margaret Hubert (my first crochet book and one I go back to again and again) and the YouTube tutorial on Tanis’s website Interlocking Crochet , and with only a small amount of frogging and an occasional sprinkling of bad language, I managed a sample square. 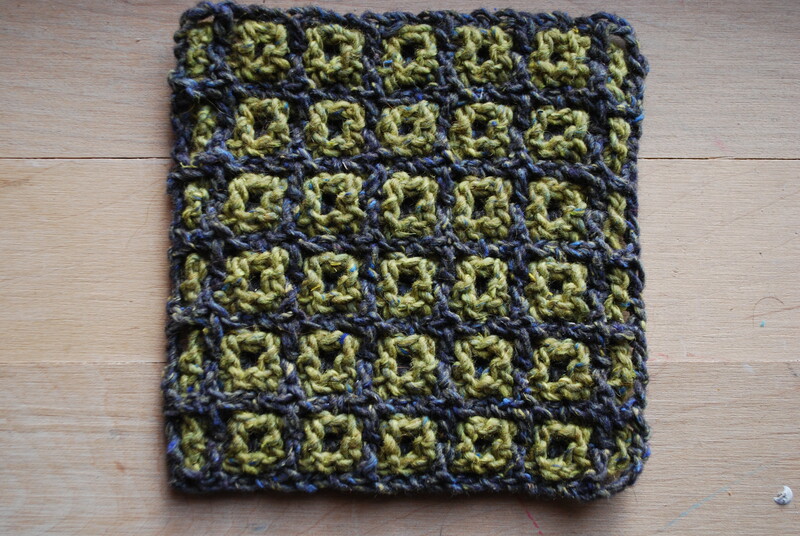 This is the basic stitch pattern and my first attempt shown here in Sublime Tweed Wild at Heart (limey green) and Down to Earth (dark purplish grey). 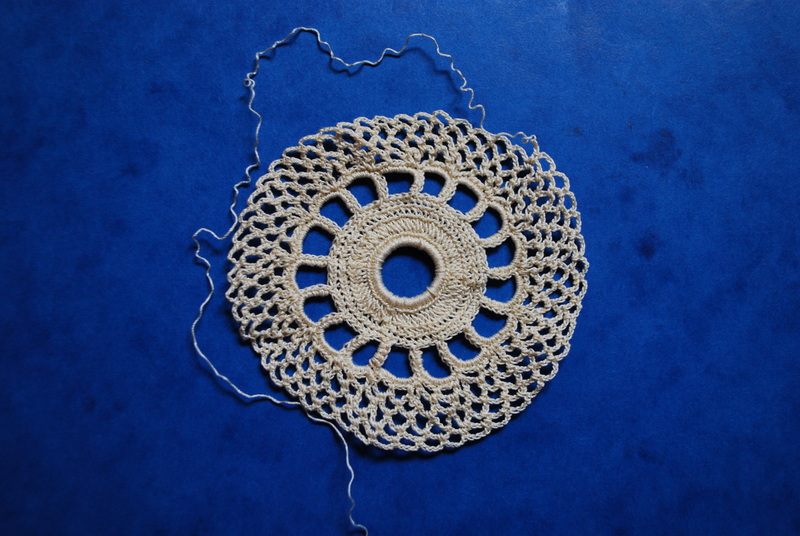 It is a bit tricky to get your head around but essentially you are crocheting two independent squares of filet that are woven together as you go along. It does become clear as the pattern emerges and it is hugely satisfying when the penny drops. There is fine line, however, with this stitch between pleasingly retro and something your grandma would have worn as a waistcoat or made into a tea cosy. I really like the lime green/grey colours but I also tried it in green and pink cashmerino and it looked really quite horrible. I am not even going to show you a picture! The fabric created is quite dense making it suitable for things like bags and afghans (and tea cosies). I have been meaning to make a bag for myself for some time so this may well be the excuse I have been looking for. It is also reversible which makes it great for blankets. Clever isn’t it? Tanis Galik’s book arrived just as I was getting comfortable with the basic squares pattern. It is a comprehensive book with very many interesting patterns but I just found it impossible to follow the instructions. 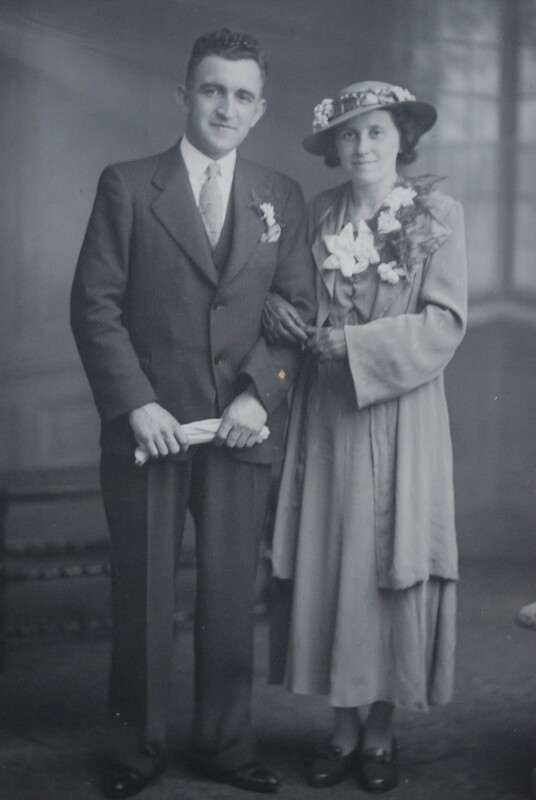 I am famously rubbish at following written patterns, I much prefer using diagrams and/or making it up from looking at the pictures, so it may just be me. The projects in the book are also not really my cup of tea although they appear to be very well executed and technically challenging. I will be using it as a reference, however, and I might even figure out how to do read of the patterns. My next challenge…the starry sky interlocking crochet stitch pattern. 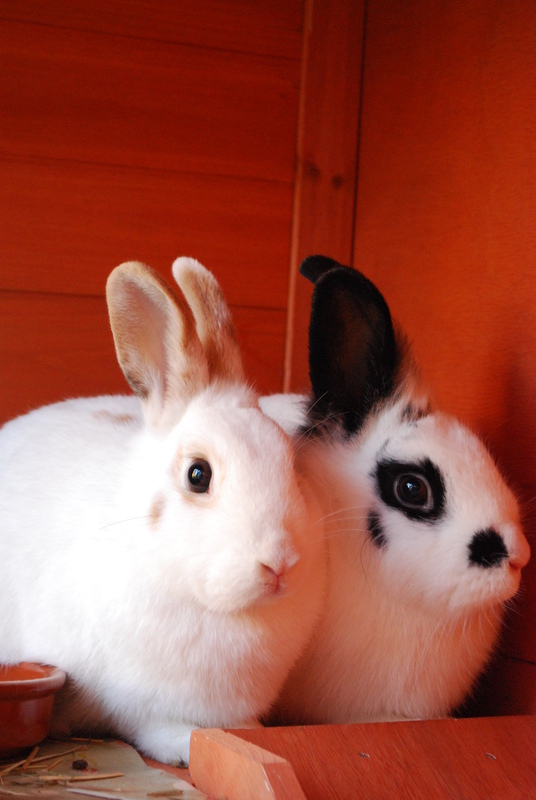 Two scampery rabbits, Betty and Bugsy, have recently joined our household and all things bunny related are suddenly very popular. 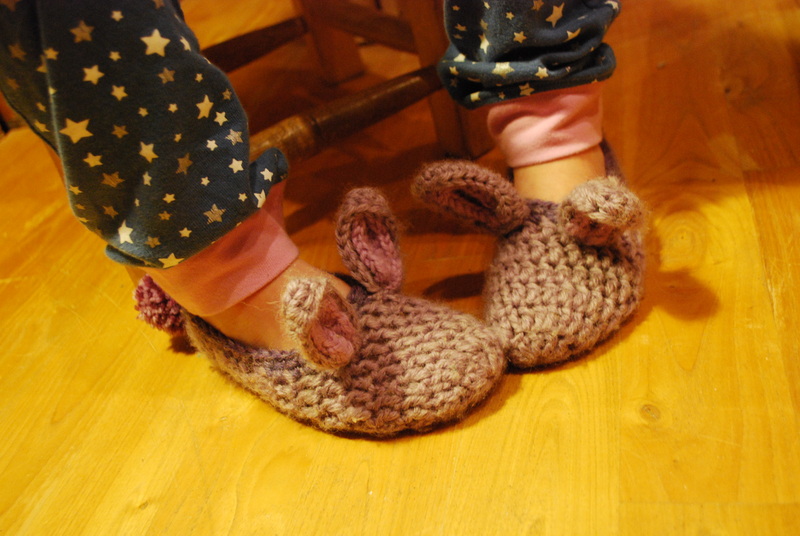 These slippers were a quick make and have proved to be extremely popular with a younger member of the family. She also loves purple so I made these using a double strand of Debbie Bliss Blue Faced Leicester DK in Lilac and Heather. I also used a bit of pink that was in my basket, not sure what that was. 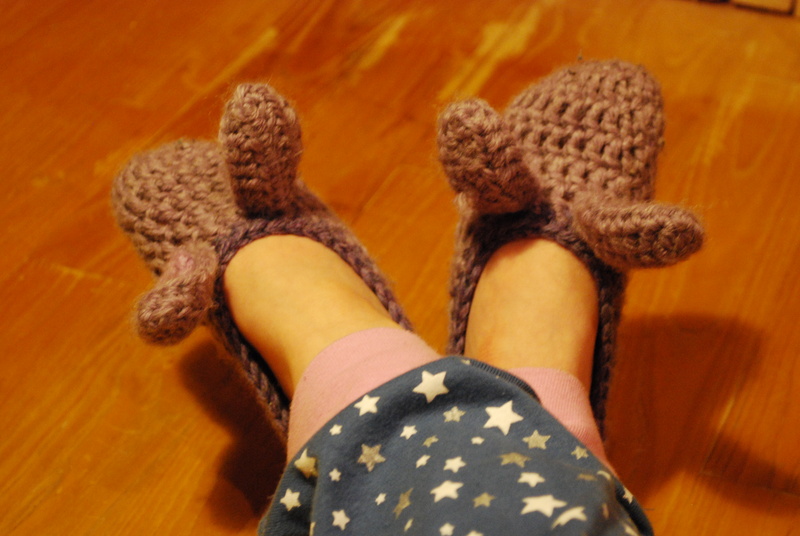 I based them on the LoopyKidz Super Simple Slippers pattern, which was easy to follow and really is super simple. These are not a technical make but if you want a quick, cosy crowd pleaser they are perfect. I have also recently discovered pom pom makers thanks to my crafting friend and blogger Jo at Three Stories High. You can just see one pom pom tail peeking out from the back. Mine are made by Clover and are about £5 for 2 which is well worth it for the time saved in wrapping wool around bits of fiddly cardboard. My top tip for these slippers is to make them a bit smaller than you think because they are quite stretchy and won’t stay on the feet if they are baggy. 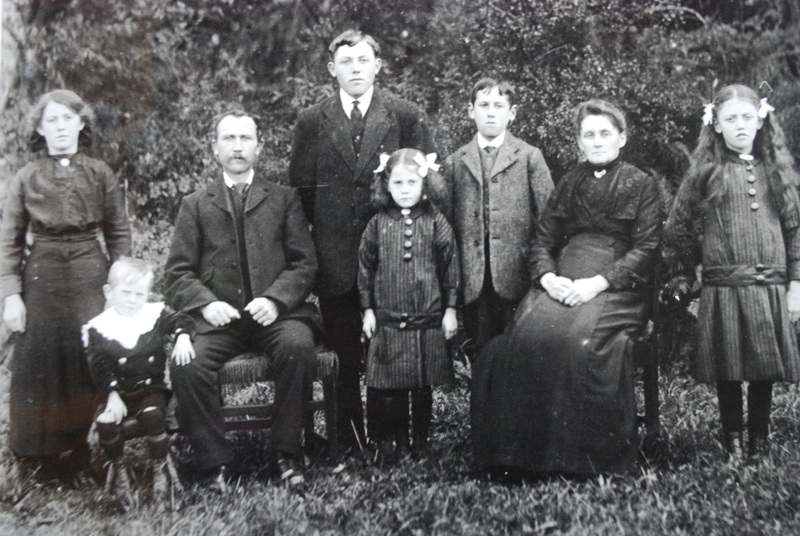 It has been a dampish and oddly warm January day and I am starting on my new blogging adventure. Be gentle with me, I am new to this. I have always been a crafter and I have experimented with a great many things from basketry to spoon carving but the one that has stuck with me has been crochet. 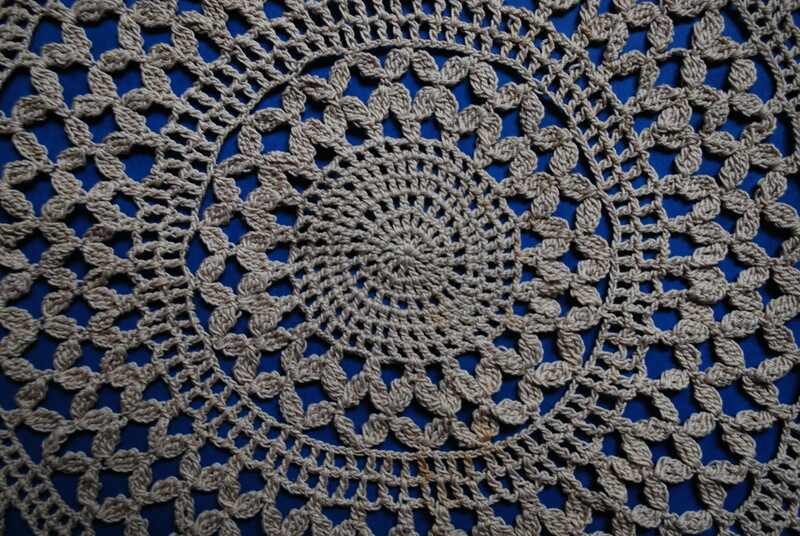 Crochet is a calm port in a storm and, so far, still astonishes me with the amount of possibilities and projects that are possible from garments and the traditional doily to yarn bombing, political craftivism and the downright bonkers. 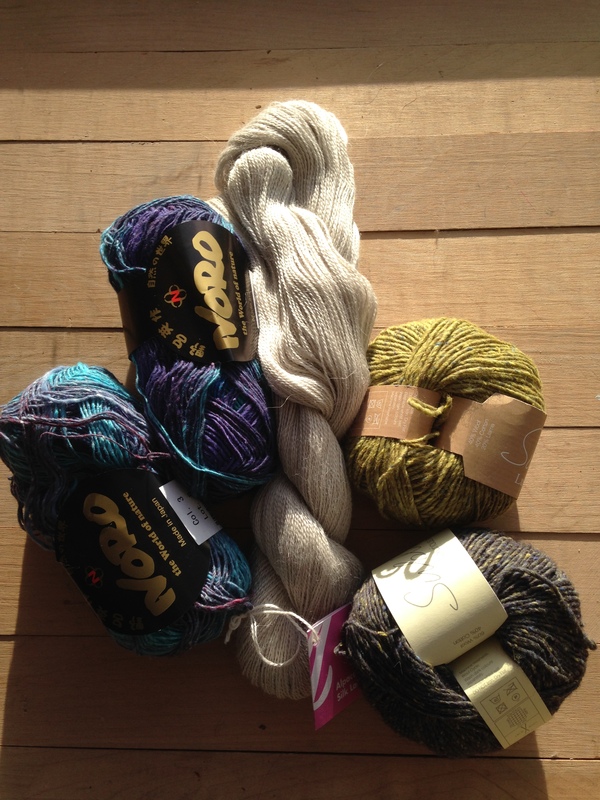 I can’t think of any better way to start a crochet and woolly things blog than a small shopping spree to my local yarn shop, we all need a little inspiration from time to time, well that’s my excuse anyway. I actually very rarely spend money on expensive wool but it feels like a special occasion. 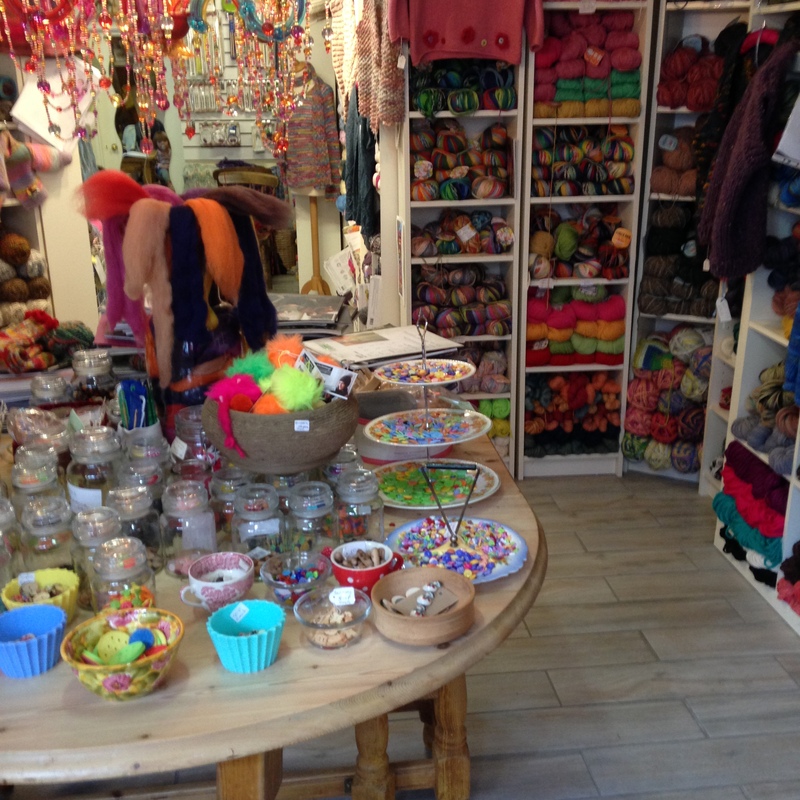 Ippikin in Much Wenlock is always a delight to the eyes and a danger to the purse! Whilst it can seem expensive at first (real wool always does), the quality of the products speak for themselves and who can resist this riot of colour and texture. I love good yarn and natural fibres and, whilst you can probably source similar cheaper online, there is no real substitute for squishing the balls and holding the colours next to each other. This is my little haul from my shopping trip, a slightly guilty treat! 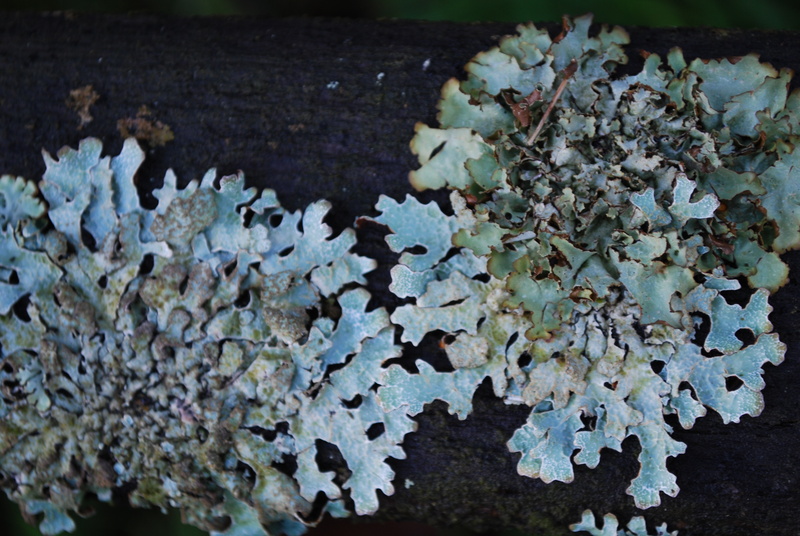 They may not look like a very coordinated combination but there is method in my madness, which I hope will become clear over the next couple of weeks. I have been wanting to try out some Noro yarn for ages so I really hope that it lives up my expectations. I am not usually that keen on colour change yarn but the colours in this are stunning. I hope that you come back again to have a look at the things that I have made. Bye for now.